I am so excited for the opportunity to enter this quilt in the Blogger’s Quilt Festival, as it is definitely my favorite finished quilt so far. Neighbourhood was one of my first designs I posted for Quilt Design a Day. The design reminded me of a neighbourhood block with houses and fences. When thinking about fabric, I knew I wanted to try Oakshott Colourshott Cottons with this one. Those vibrant colors would be perfect. I paired the 10 x 10″ Colourshott cottons with Kona Oyster. 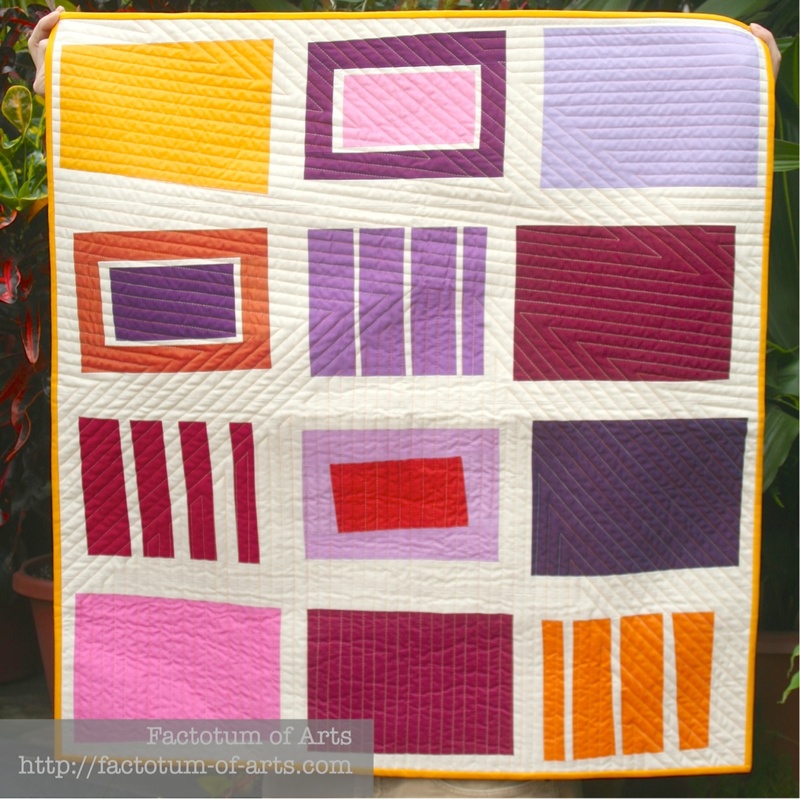 The back of the quilt was made from left over scraps, designing as I went to produce these improv blocks. I love the look of the totem pole on the back. I really wanted it offset. I struggled with the quilting on this one, as I did not want to take away from the design. 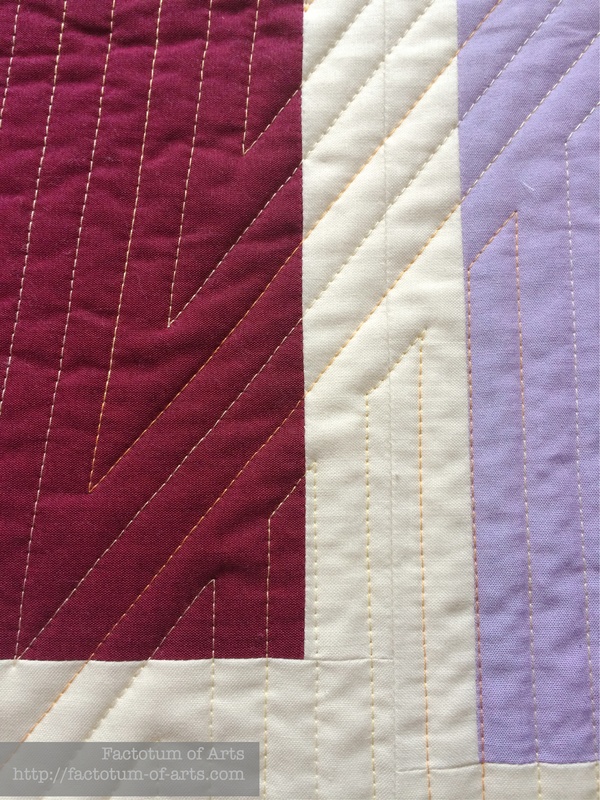 I decided on straight line 1/2″ quilting but changed it up a little by adding angles. I used painters tape/washi tape for guides. I think one of my favourite decisions was the choice of the Aurifil #4658 wt. 50 (Sunshine Variegated Thread) which is so hard to capture in photos. It just adds that little something. 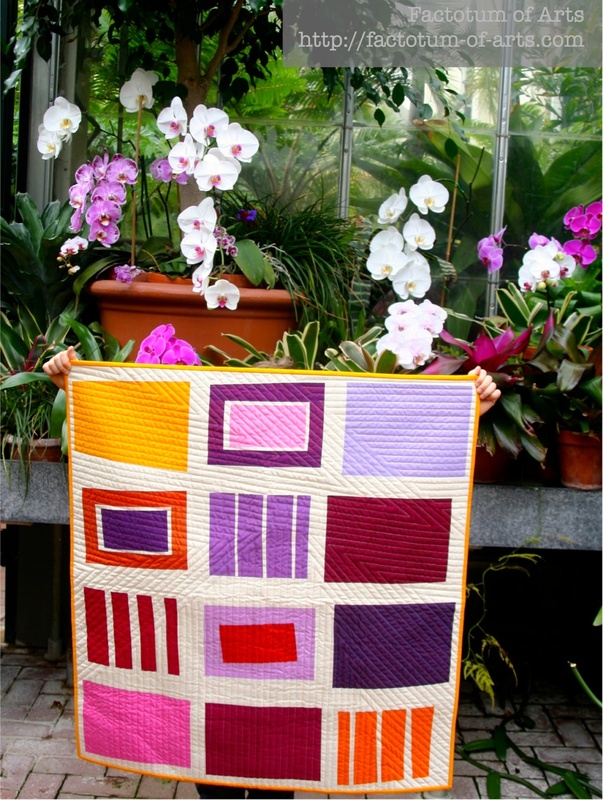 The wonderful Amy is hosting the Bloggers Quilt Festival again, and I am entering in the Small Quilt Category. I would encourage you all to have a go and enter in one of the categories. Good luck and have fun!! Voting begins 1st November. 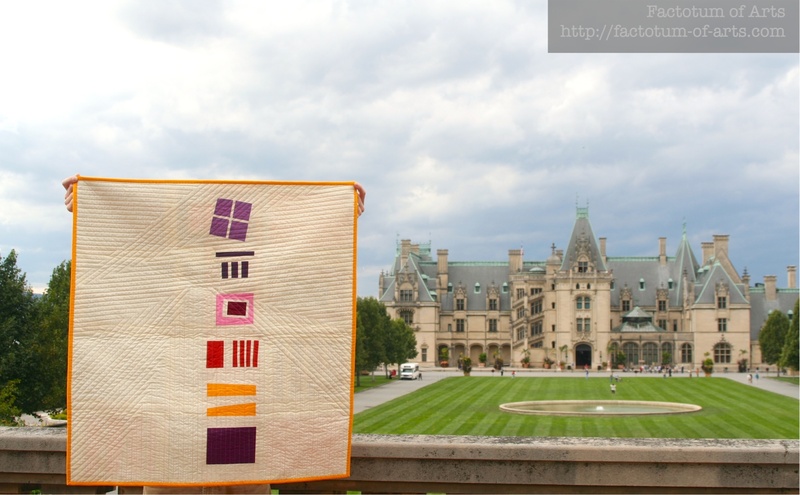 This entry was posted in Uncategorized and tagged bloggers quilt festival, Bloggers Quilt Festival 2014, Neighbourhood, Small Quilt Category on October 30, 2014 by mlwilkie. It’s really lovely, and the quilting is perfect for the design. Good luck! I really like getting to see this lovely quilt again. Good luck and have fun with the festival! Good luck! It,s just gorgeous… So my aesthetic. I love modern, simply straight lines and solid fabrics. 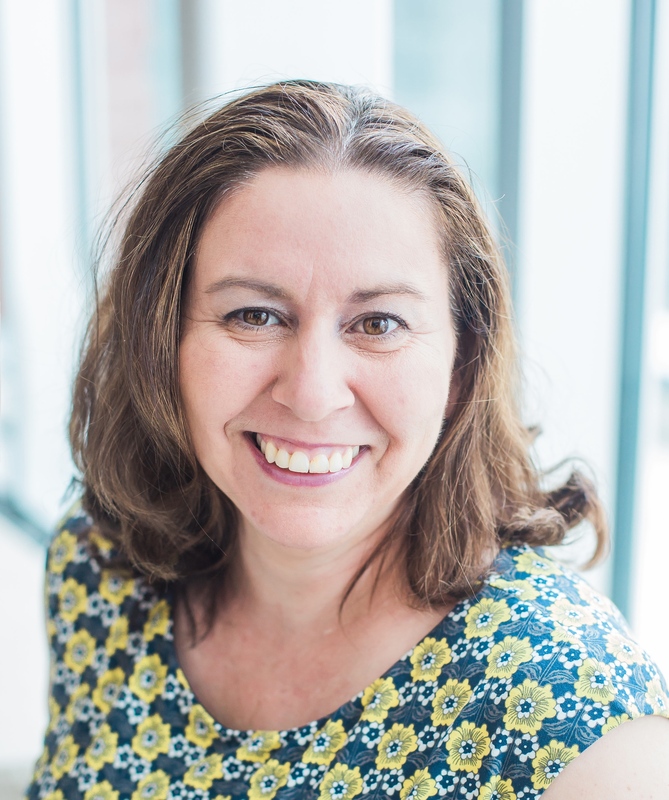 Your colors and quilting are lovely! Love it. Love this! So vibrant and fresh! Voted for this one, for sure 🙂 Until your last photo with the flowers, I don’t think I realised how small this actually is! Very cool. 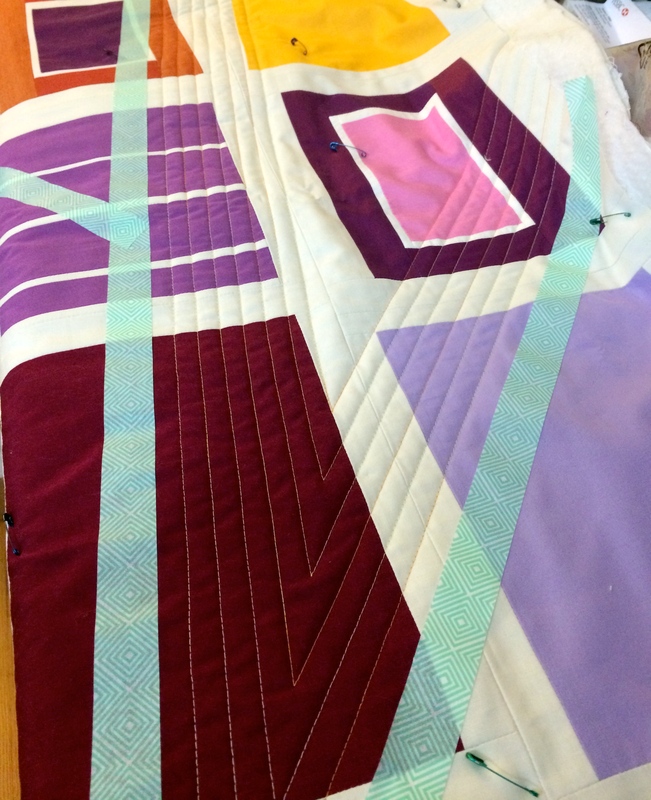 I love the colors, the improvisational blocks, the angles quilting, and even the back.